Azienda Scacciadiavoli is located in the Montefalco area of east-central Umbria. Founded in 1884, it is one of the oldest wineries in the Montefalco wine-producing zone and has approximately 85 acres under vine, most of which is devoted to the Sagrantino variety. Its colorful name “Scacciadiavoli” (sha’ cha dee avh’ oh lee) loosely translates as “banish or chase the devil” and it comes with a story. It’s based on a centuries-old folk tale that alleges a woman possessed by the devil was able to successfully expel the devil during an exorcism that involved drinking some of the local red wine. I guess the moral is that red wine is good for whatever ails you. Anyway, I love that story! Sagrantino is both the name of a grape variety as well as the name of the wine produced from that variety. It is the dominant variety in the hills surrounding the village of Montefalco in Umbria and several nearby communities. Sagrantino wines from this area qualify for designation as Montefalco Sagrantino and the appellation was granted DOCG status in 1992. The variety is very finicky and site specific and has not been successfully grown commercially anywhere apart from Umbria. The Sagrantino variety is deeply colored and chock-full of tannins and acidity. It produces big, intense and full-bodied wines that are very tannic and tight as nails in their youth and require long ageing to soften the tannins and tame the grape’s natural acidity. Typically, they don’t start to come into their own until at least 8 to 10 years after the vintage date. 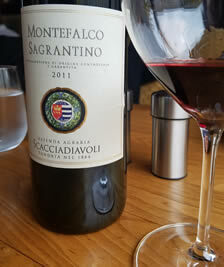 Scacciadiav oli’s 2011 Montefalco Sagrantino is made entirely of estate-grown Sagrantino. The grapes are fermented for approximately one month in large French oak vats and then aged for 15 months in French oak barriques followed by 6 months in stainless steel vats and an additional 9 months in the bottle. The wine has a bold and generous personality with complex dark fruit and spice aromas and packed with mouth-filling ripe cherry, prune, and cassis flavors. It has a firm structure with prominent tannins and fresh acidity that foretells a long life for the wine. While rich and flavorful now it is just starting to come into its prime and is sure to develop more complexity with some additional bottle age, that is, if you can wait. The finish is a real treat, long, grippy and persistent with ripe, black fruit notes. The wine clocks in with 15.5 percent alcohol. Decant for an hour or two and serve with equally robust, special-occasion dishes like braised red meats or game. It’s sure to generate a positive buzz among your dinner guests. Not that I feel compelled to name-drop but it’s worth noting that this wine garnered the #66 position in Wine Spectator’s Top 100 wines of 2017 from around the world.